There were no major economic reports to support GBP and today the new Fed Chief Powell testifies for the first time which will bring some volatility to the market. The support rests at 1.39410 with resistance at 1.39940 which the weekly pivot point at 1.39570 is located in between the lines. The EMA of 10 is moving horizontally in the ascendant channel and it is above the EMA of 200 and the EMA of 100. The RSI is moving on the 50 level, the Stochastic is moving in low ranges and MACD line is on the signal line in the neutral territory. The ADX is not showing any clear signals. 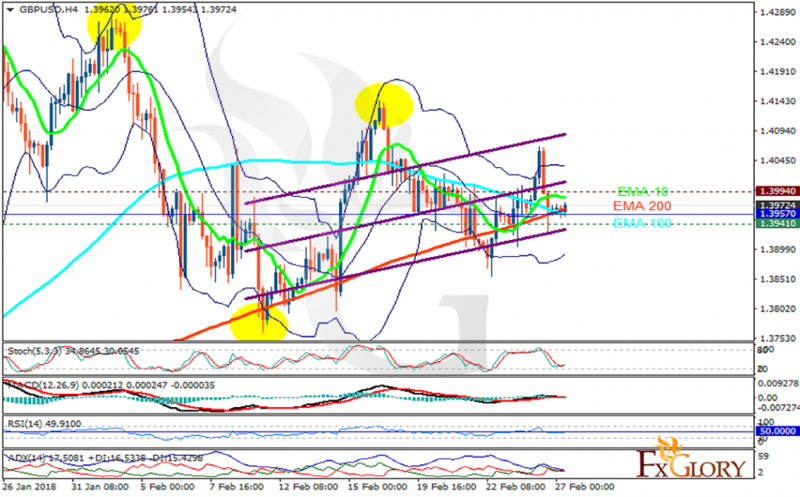 GBPUSD will be consolidating within the Bollinger bands, however, the resistance level breakout will push the price up towards 1.41.